This outfit was literally thrown together, there wasn't a single bit of planning involved and it's actually turned in to a new favourite. The dress from H&M was sent to me my mistake, the only similarities with this one and the one i actually wanted is the colour. I didn't even try it on, i didn't want to keep it but after running out of time to return it i thought I'd bite the bullet and try it on and i actually love it. The only downside is it creases like hell, but i guess it's not that much of a problem. This shimmery cardigan was my mums, way back when and is waiting to be sold on eBay but when i saw it hanging up i knew it would be perfect with the pink and bright yellow. These glitter loafers are by far my favourite pair of shoes i've ever owned, not only are they wonderfully sparkly they're also really comfortable and i want them to last forever. If you're loving the glitter shoe trend as much as me then check out these glittertastic wedges! How amazing?! I've also fallen head over heels (excuse the pun) in love with a pair of patent slightly heeled pumps from LK Bennett and will spend my days lusting after them! Oh Sarenza look what you've done to me with your fab collection of womens shoes! So i know I'm with the masses when i say i have Olympic fever but i seriously I have Olympic fever. I've spent my whole weekend glued in front of my tele box watching things i wouldn't of even given a second thought about (volleyball, badminton, sailing...) and getting confused about scoring, er track cycling at the velodrome I'm looking at you but it's been fabulous and I'm going to be really sad when it's all over! Can we host games every time?! Ooh I love this outfit so much, you look lovely! I love your dress-its a keeper! I'm also really jealous of your pretty,sparkly loafers and clutch! Absolute shoe envy and bag envy too! Love it all. I'm the same with the olympics. Who would have thought that archery and fencing could be so addictive? ha, Katie Taylor, Irelands golden girl is in her first fight in an hour! So excited to see her go! Best outfit of you so far! Love it! Love, love love those shoes!! Lush! And the bag works so well with the dress colour. Aww you look so gorgeous! Love these colours together...you look like a rain of sunshine! Sometimes the thrown together outfits end up being the best, I love it! I think the contrasting clutch really finishes it off well! Love all the neon and the shoes are gorgeous! Aww, I love this look. I love when a random mix of clothes you weren't planning to put together somehow end up being awesome. Proof in this outfit! Oh please share what lipstick you are wearing! Thanks! Thanks your comment in my blog! I'm here a new follower, because your blog is amazing and you're so pretty! Love your Necklace and the way you've styled the dress. what a lovely dress!! you look so pretty! That colour really suits you, good job you didn't send the dress back hey?! I have become OBSESSED with the Olypmics, I really didn't think I'd be bothered about watching it and now I can't tear myself away. Your V necklace is so cute and I love your bright clutch! This dress is SO your colour! It looks gorgeous!! Love your outfit and loving your blog. 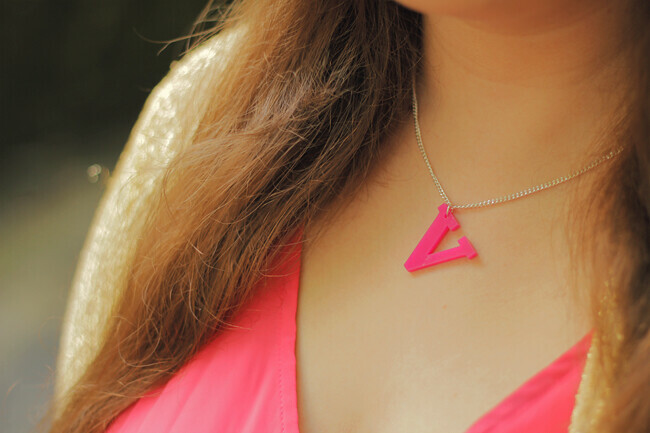 Love love love your cute little necklace! Stunning outfit! 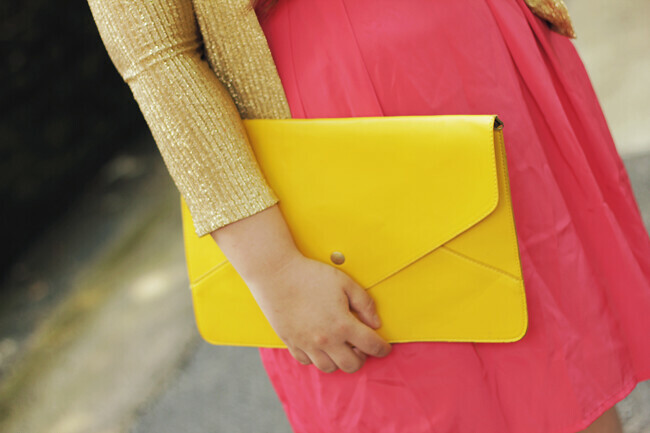 Love the bright yellow clutch with your outfit! Totally gorgeous! 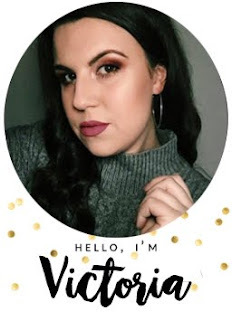 I am sending your link to my friend, she is travelling abroad and looking for some style inspiration - she told me to send her my fave bloggers, and you have PERFECT style!